At Inspired Art we are hugely passionate about art and only offer the best quality products to inspire your creative adventures. Our beautiful handcrafted paint brush set is made with only the finest materials and is a treasure for artists of any age and ability. Whether you enjoy watercolor painting, acrylics, oil painting, gouache or even face painting, these brushes are perfectly suitable and will keep on performing wash after wash, for maximum durability. Sable, hog and goat hair brushes just do not compare with these synthetic hair brushes. 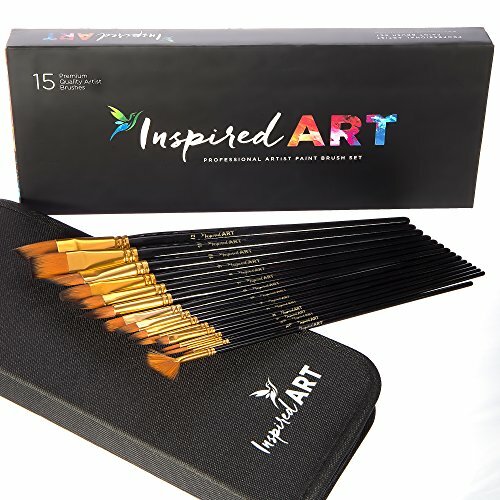 The brushes in the Inspired Art set will wash out more easily, will retain their shape even after multiple uses and will last much, much longer. This set is beautifully presented and makes a lovely birthday, thanksgiving or Christmas gift for any art enthusiast. This is a great quality paint brush set and we pride ourselves on our proven rates of customer satisfaction. We're so sure that you'll love it that we're offering a lifetime money back guarantee. So you can order with confidence! Copyright © Inspired Art 2016. SUPERIOR QUALITY - This set of 15 handmade paint brushes offer the finest quality any artist could desire. With non-shedding hairs, your masterpiece will never be ruined by stray bristles! Double-crimped ferrules provide added stability, and long, ergonomic handles provide comfort and balance for the perfect painting experience. WIDE VARIETY OF BRUSH TYPES FOR A VERSATILE FINISH - The diverse range of brushes included in this paint brush set with case provide all the tools any keen artist requires. With various brush types including angled, flat, round, filbert, rigger and fan, and with brush sizes ranging from 3/0 to 12, this set has everything needed for an enjoyable and fulfilling art adventure for acrylic, oil or watercolor painting! POP-UP STAND & PROTECTIVE CASE - Such a great quality set of professional artist brushes deserves a sturdy case to ensure they are well protected. This portable carry case is ideal for transporting your brushes to art class, school, college, or you can even take them on vacation! The innovative pop-up stand makes an ideal holder for your brushes while you paint, and also provides a great way to air-dry your face paint brushes after cleaning. SUPER LONG-LASTING DURABILITY - The mixed synthetic hair provides much better durability than natural hair paintbrushes. These watercolor paint brushes offer excellent shape retention, so you can easily re-shape the bristles of your brushes after washing. Paints wash out very easily too, meaning that your set of oil painting brushes will perform better and stand the test of time. THE PERFECT GIFT THAT EVERY ARTIST WILL LOVE - Whether your loved one is a professional, amateur, student or beginner, this beautifully presented watercolor paint brush set of immaculate brushes will delight artists of all abilities and ages. Hand-packed with care and presented in a lovely box, this set makes a perfect gift for adults or children. LIFETIME MONEY-BACK GUARANTEE - We are so confident that you will love this set that we offer a no-questions-asked money back guarantee. If you have any questions about this product by Inspired Art, contact us by completing and submitting the form below. If you are looking for a specif part number, please include it with your message.